Dr. Ana Jurcak-Detter attended the State University of New York at Oswego where she also played Division III Women’s Soccer. At Bowling Green State University (BGSU), she was a member of the Laboratory for Sensory Ecology for both her master’s and doctoral degrees in biological sciences. Her research at BGSU focused on animal behavior, specifically understanding the sensory environment of predator-prey interactions. 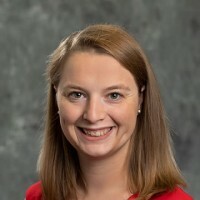 She conducted her research each summer at the University of Michigan Biological Station in Pellston, Mich. During her Ph.D., she was also a part of the NSF funded Northern Ohio Alliance – Alliances for the Graduate Education and the Professoriate and participated in many STEM outreach events.